Colfax (formerly, Alden Grove, Alder Grove, Illinoistown, and Upper Corral) is a city in Placer County, California, at the crossroads of Interstate 80 and State Route 174. It is part of the Sacramento–Arden-Arcade–Roseville Metropolitan Statistical Area. The population was 1,963 at the 2010 census. 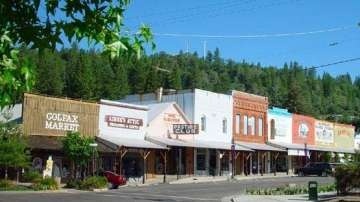 The town is named in honor of U.S. Vice President Schuyler Colfax (1869–73), a bronze statue of whom stands at Railroad Street and Grass Valley Street. (This is the only known statue of Schuyler Colfax in the United States). Some of the town's notable features include the newly restored Southern Pacific Railroad colonnade-style depot (which houses the Colfax Museum and Chamber of Commerce) built in 1905, the downtown shops on Main Street, and Colfax High School, which serves a large surrounding area.